Potatoes are one of the best known sources of potassium, a mineral required for optimal cell and nervous system functioning, as well as blood pressure maintenance. Despite the fact that they've gotten quite a bad rep lately (thanks to some studies which suggested that they easily make us pack on the fat), there is no reason to fear eating potatoes. When eaten in moderation, prepared correctly and enjoyed sensibly (and responsibly! ), potatoes do wonders for keeping our tickers and blood vessels healthy. 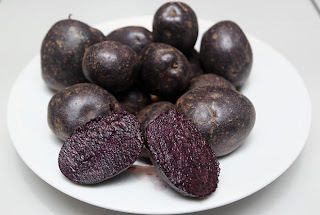 More still, the more colourful the potato - red skinned or the purple variety - the more nutrients and antioxidants they contain which is always a bonus for keeping us healthy. According to a small new study, enjoying potatoes in smaller portions throughout the day may help lower blood pressure as much as eating oatmeal can. What's more, it was found that the participants in this study did not gain weight when eating more potatoes than they previously were. The participants in the study added 6 to 8 cooked baby purple potatoes to their diets twice a day, each day for a month enjoyed significant reductions in their overall blood pressure. The study's lead researcher, Joe Vinson from the University of Scranton in Pennsylvania wants people to know that potatoes aren't bad guys when it comes to our waistlines or our health. Sure, some of the most fattening foods like potato chips and french fries happen to be made from spuds, but there's no rule that says they have to be deep fried to be delicious! Steaming, baking or boiling them with a little salt-free seasoning like Mrs. Dash makes for a delicious and nutritious addition to any meal or snack. In the study, the spuds were microwaved, which is another easy and quick option for preparing them. So now that some of the fuss that was created around potatoes in recent months has been put aside, you can go ahead and put potatoes back on your menu. That is, if you even took them off to begin with!